Hello! I've been fooling around with an idea. Check out my new website and blog. I'm still waiting on the Secretary of State to become an LLC, but in the meantime there's still plenty to set up! I never met Mary Bowers when she was alive. She was the previous owner of my loom and equipment. Her name is on everything. Her loom made its way to a second hand store. Sold with it was all her supplies and yarn. I have decided to use up some of the yarn she left. 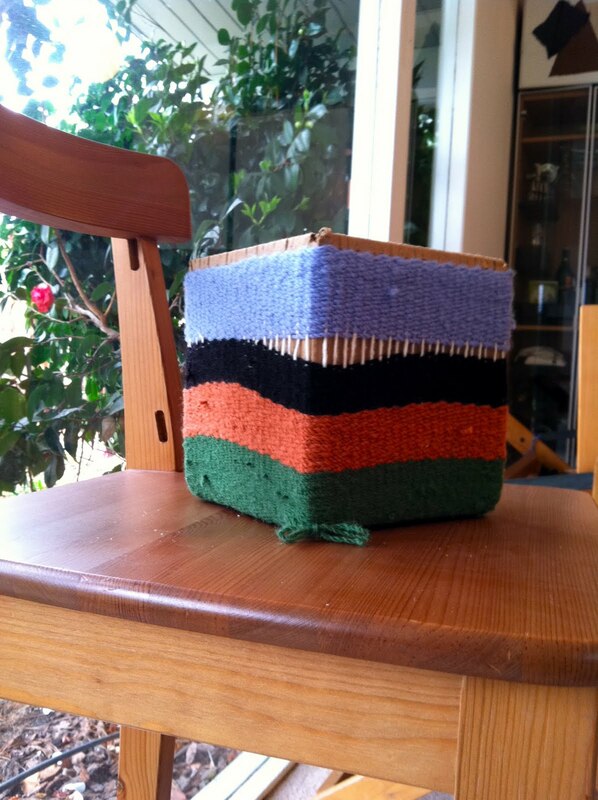 As I started threading the warp, I realized that the colors matched the seat cushion she made. She liked bright colors. They are not colors I would reach for myself, but I think Mary Bowers has something to teach me. 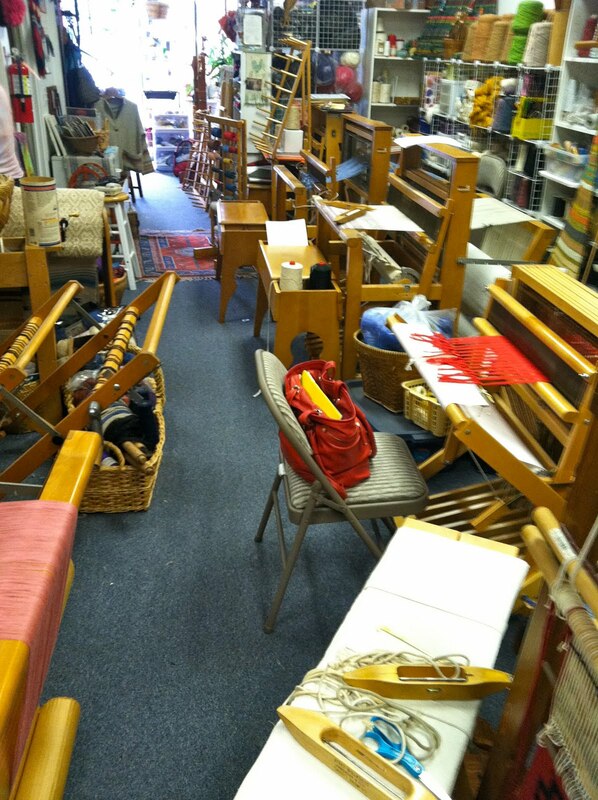 Update: This loom was claimed on 4/9/11. Thank you! If you are willing to come pick it up in the south bay area, I'd like to give this floor loom a new home. 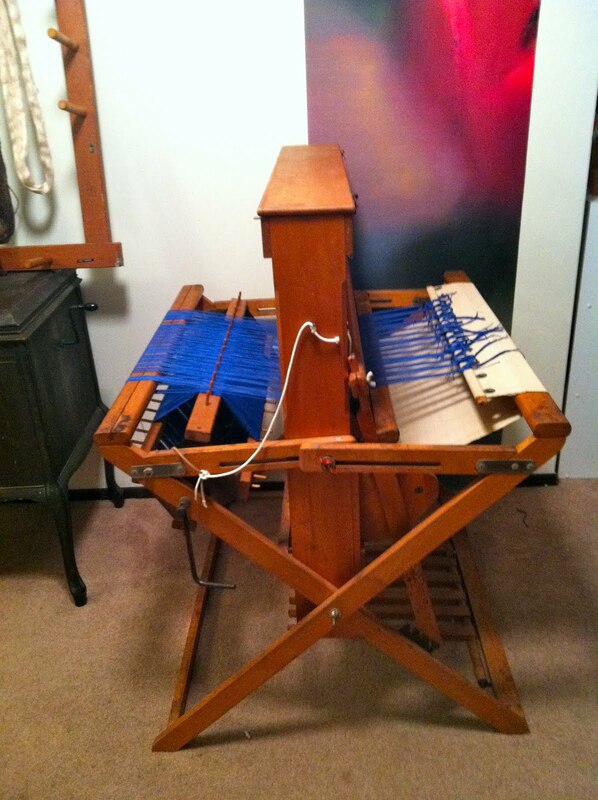 It's a four harness jack loom with a built in rattle in the back. The brand name tag appears to have fallen off. I already had my big Gilmore loom when a family friend offered Emily a little loom of her own. That little loom turned out to be a floor loom! I signed up Emily for the beginning weaving class, and she quickly lost interest. It was neat to spend the time with her, but Mom's interests are not daughter's interests. I don't need two floor looms in my dining room! Leave a comment to discuss picking it up, please! Almost made it! Time to ply the last of the wool I had been spinning. I seriously thought I had enough green and blue for those two colors to be the only ones on this little box. I enjoyed spinning the yarn on a drop spindle. It was a color sample pack I picked up somewhere. I would take my drop spindle all over with me and attract attention. People would ask questions, and I'd show them my spinning. They would ask what I was going to make. "Yarn"! It was too scratchy for anything you would wear as a knit, and too little of it for weaving on the loom. Then I started this little box while waiting for my daughter to get off my warping board. I found the perfect use for my hanging yarn wall decorations! Not sure what I'm going to do with a little yarn basket bag, but it is more compact than skeins on my wall. Four Shaft Twill Sampler Print this link out on business card paper, and punch holes in the top left hand corner of each card. Put a ring through the holes, and you have made a handy little booklet that is easy to refer to while weaving! When I started my first weaving class, Henelore Cole, owner of Custom Handweavers in Mountain View, apologized for the old photo copy of a handout that was typed with a typewriter. I figured typing up the document for her in a word processor would help her with a freshened up handout, and I would be able to absorb the information better while typing. While working the twill sampler on the last page, I got sick of twisting to my side. I took postit notes, and wrote down the treadle numbers for each of the 62 twill patterns. Instead of left to right, I found a vertical listing of the numbers easier to keep track of. I've printed up a few of the business cards in the second link above, and given them to Henelore. She really liked the design. She lets her students use the cards, but she keeps them herself because she found them handy. I hope you find them handy too! If you are in the California Bay Area, please consider taking this class or others with Henelore. Her website can be found here.